The Iowa, Chicago & Eastern is a Midwest regional formed in 2002 from the I&M Rail Link. The railroad operates on mostly ex Milwaukee Road track in the states of Iowa, Illinois, Minnesota, Missouri, and Wisconsin. In this show, we'll highlight operations over the entire system. From the beauty of the Mississippi Valley, to the serenity of the Corn Belt, this video has it all. In the summer of 2004 the IC&E re-activated most of the IMRL SD40's and, quite amazingly, SD9 #614. Other locomotives including former IMRL GP9's, SD45's, and of course ICE's SD40-2's and GP40-2's are seen in operation. Watch in awe as former Soo Line GP9 locomotives are seen in mainline local service between Nahant and Clinton, Iowa. From surreal scenes of the moon rising over the Sabula causeway to rotating stop sign- equipped Griswold crossing signals, this video is something to behold. The Milwaukee #261, I&M Rail Link, Illinois Central, Progressive Rail, and CP/Soo are also seen in this show. Regional railroads are an important part of Midwest railroading, and the IC&E's operations are testament to the importance of keeping freight moving across the heartland. With the natural beauty of the land, combined with exceptional trains, this video shows you the best of the Iowa, Chicago and Eastern! bbauerdsm (Des Moines) on 2012-07-21 04:21:33. Very nice, high quality video. 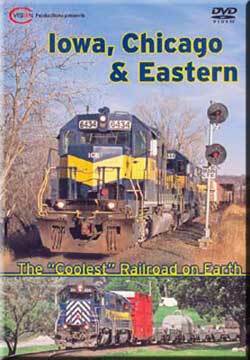 if your a fan of Mid West Railroading this one is a Must Have. Jayson B on 2010-02-04 08:46:17. Excellent DVD on the IC&E! Highly recommended for any IC&E fan! And C-Vision has more coming so order your copy today!